Mount Washington is known as having the worst weather on earth. The weather observatory at its peak even has the slogan “Home of the World’s Worst Weather”. 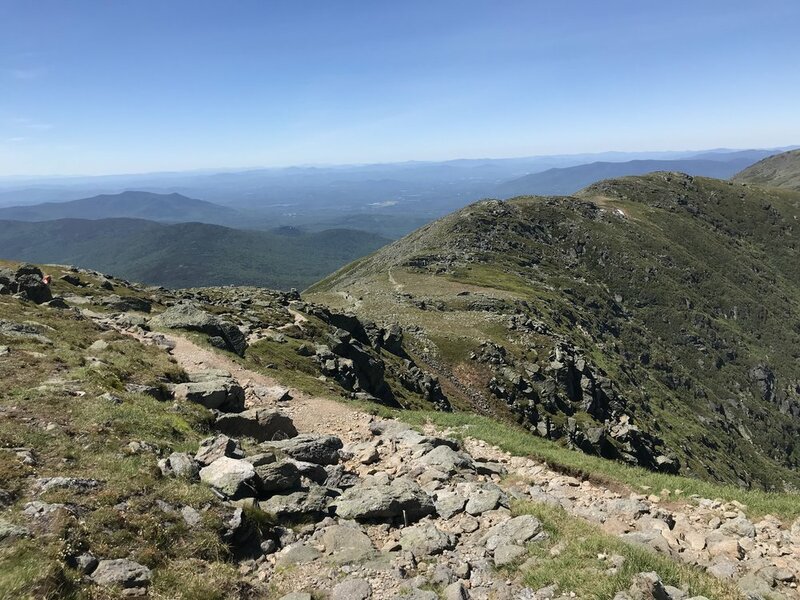 I was lucky enough though on the day I climbed Mount Washington, as part of running the Presidential Traverse, that the weather was perfect. On Mount Washington that day, there was an average wind speed of only 11mph and a temperature that averaged in the mid 40s. A reason for being lucky is that the weather is very unpredictable there, and I had only 1 day where I could attempt the traverse since my trip was sandwiched between dropping my daughter off at camp on a Thursday and having to catch a flight back home on Sunday morning. In June at Mount Washington there were 5 days with wind gusts above 75mph and almost half the days had rain. Mount Washington also has the highest recorded land wind speed ever at 221 mph (370 kph) so the weather can be terrible. I was also lucky that the skies were blue and visibility was excellent. These mountains are known for being socked in by clouds with visibility dropping to near 0. I can’t imagine navigating these trails by cairns that can only be seen every 20 yards (20m) or so. 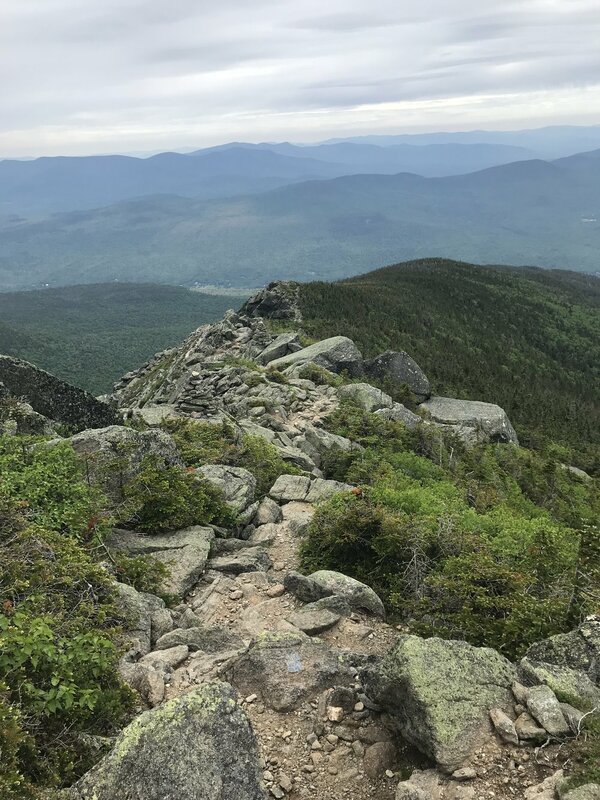 The Presidential Traverse isn’t just about Mount Washington though that peak is just the most well-known part of the traverse. I started my run from the South starting at the AMC Highland Center Lodge. From my reading on the traverse, most people prefer to start from the North as it gets the most major ascent out of the way early in the run. However, my preference was to start at the lodge and not need a shuttle in the morning to start. In addition, I booked the Madison Spring Hut as my destination for day 1. I started South with Mount Webster, then proceeded back north to Jackson, Pierce, Eisenhower, Franklin, Monroe, Washington, Clay, Jefferson, Adams Five, Adams, and then stopping at the Madison Spring Hut. 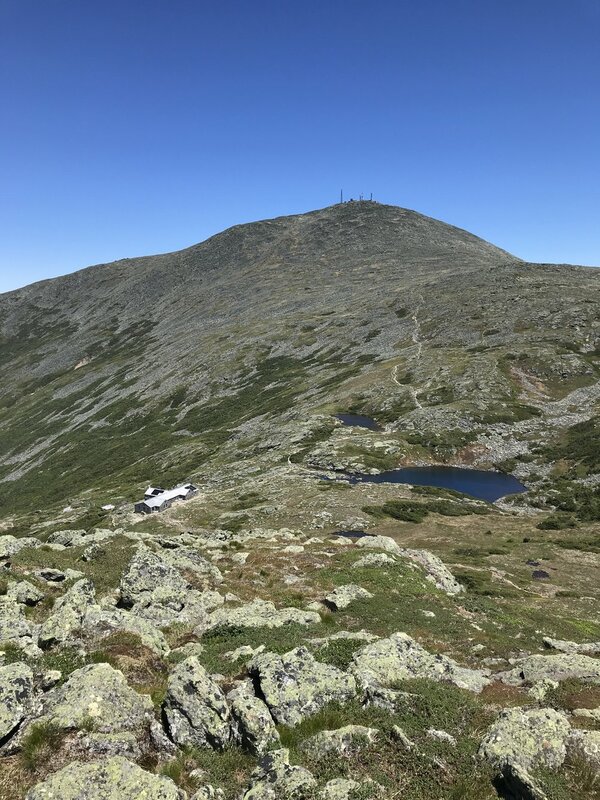 I had wanted to climb Mount Madison on the same day, but I took much longer than I expected to get there and if I missed dinner at the Madison Spring Hut there were not any other food options. I called it a day and had dinner at the lodge. While I ate dinner, I met several interesting people who were through hikers on the Appalachian Trail. While asking them about their favourite parts of the trail many talked about the Smokey Mountains, especially in the Davenport Gap area. On my way home I immediately planned that trip as I’d read about it before, but with first hand recommendations I knew I had to do it. I’ll write up that trip in my next post. There are multiple lodges on the trail so you need not carry all of your water. However, given the unpredictable nature of the weather, it’s critical that you have whatever supplies you need to be self sufficient and be able to survive a night on the mountain. I was carrying with me my full rain suit and a fleece jacket and my other emergency gear. I even ended up wearing everything I brought since it rained and got fairly cold while waiting for the shuttle at the end. The night before my run in the lodge dining hall I was talking to a woman who hikes the trail frequently. I was asking questions about the trail and soon realised that a) I hadn’t researched the actual terrain enough and that b) she didn’t think I knew what was in store (which was true). I’d told her I was planning on making it to the Madison Spring Hut by dinner and could tell it surprised her, especially given my naïve questions. I asked her about the footing and she said several of the peaks were just composed of boulders. I couldn’t visualise what she meant, but once I made it to Mount Adams, I figured it out what she was talking about. The only way I can explain it, which won’t do it justice unless you see it in person, is that the mountain was made by a giant scooping up truck size boulders and then sprinkling them on the ground to make a mountain. I don’t know how anyone could run these mountains; it was all I could do to not fall, especially when coming down from the peaks (and it was dry when I did it, the granite must be supers slick in the rain). The climb was just a series of large steps from boulder to boulder for hours at a time. On day two I made the ascent up Mount Madison and then made the 4 mile descent to the trailhead where the shuttle would pick me up. While waiting for the shuttle I happened across one of the coolest bits of nature I’ve ever seen. I was tired of just waiting for the shuttle and was also getting cold in the rain so I got up and wondered around and saw a trail head and followed it. The trail I happened across is called the Fallsway Trail. On my hike, I soon came upon the first waterfall. 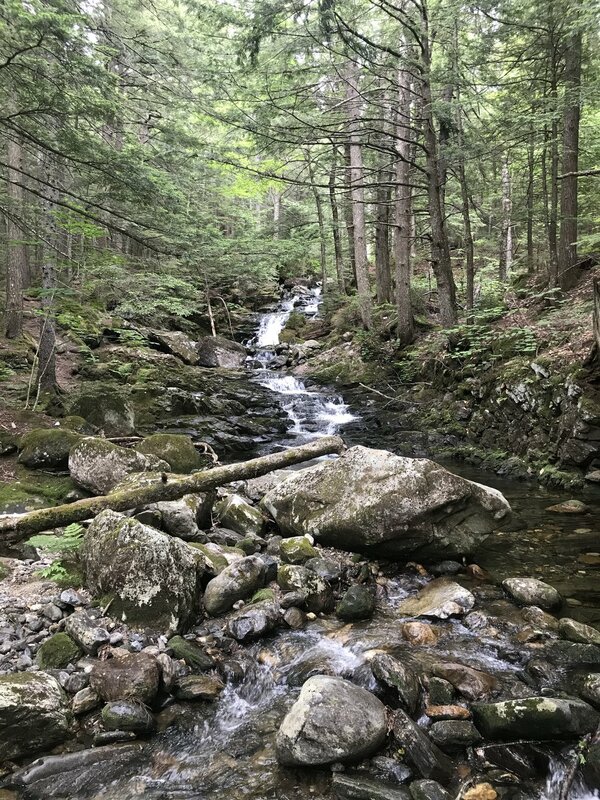 As I continued up the trail, it surprised me to find waterfall after waterfall along the trail. Even though it was a Saturday morning, and maybe it was because of the weather, there was no one out on the trail. What an amazing bit of nature to experience all by myself. Surprisingly, this little trail was one of the high points of the trip. For the route I took, the Presidential Traverse comprised 23 miles (37 km) and 9,000 feet (2740 m) of elevation gain. It was a true ultrarunning destination given the difficulty of the terrain, unpredictable weather, and overall elevation gain and loss. If you plan this trip, do not attempt it at all costs! It is possible you must abandon your trip or alter your route because of the weather. You must monitor the weather before and during your attempt. In addition, for context I highly recommend the book Critical Hours: Search and Rescue in the White Mountains. I couldn’t fully appreciate the book until I ran the traverse since the descriptions of the weather and terrain are so extreme. Now I’ve experienced it firsthand, I can understand the challenge of rescuing people on the mountains and the risk it puts on the rescuers. And if you don’t get the book, at least read this article on Why Mount Washington Kills (published in Outside Online). If you are not in a position to self rescue, are not carrying a full set of gear, and haven’t researched the weather, then an attempt should not be made. But if you have prepared, it offers some of the most unique terrain I’ve seen in the world and will be a trip you never forget. I drove to the AMC Highland Lodge from Burlington, VT. I took my time driving across the state and visited a maple syrup farm, a creamery, a museum and had a relaxing lunch at a restaurant that used its garden out front for some of the dishes. That area of the US is quite beautiful and can also be very remote. Be sure to call ahead to the Appalachian Mountain Club who maintains and takes reservations to the lodges and huts. I was told they fill up quickly and also be sure to pre-register your shuttle as those also can get full and they definitely make for a great option to get in a point to point run.